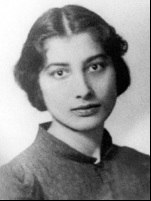 Noor Inayat Khan lived a remarkable life of self sacrifice for the cause of freedom. Brought up in the mystical Sufi tradition, Noor abhored violence but she willingly volunteered for the dangerous task of being a secret agent in occupied France. Noor was the great great great granddaughter of the celebrated Muslim ruler of Mysore – Tipu Sultan, who in the 18th Century fought the British, stemming their advance into South India. Ever after the British held the family with high suspicion but her father Hazrat Inayat Khan did not pursue a political path. Instead Hazrat Inayat Khan was responsible for bringing the great spiritual tradition of Sufi mysticism to the West. In particular Hazrat emphasized the role of music as a means of promoting spirituality. Hazrat Inayat Khanmarried an American, Ora Meena Ray Baker Noor (distantly related to Mary Eddy Baker founder of the Christian Science movement) The couple married in Paris and settled in Russia. Hazrat Inayat Khan was also the father of Pir Vilayat Inayat Khan who was later to take on the leadership of the Sufi order in the West. Noor was born in Russia in 1914 and after a brief spell living in England the family relocated to France. Noor believed in the principles of ahimsa (non violence) but in the face of overwhelming Nazi aggression of 1939-40 she felt compelled to take an active role in the liberation of Europe. (see link at end for her discussion of non violence with her brother Pir Vilayat) Therefore Noor decided to flee France and getting on one of the last boats to England, she was able to sign up in the WAAF (the Women’s Auxiliary Air Force) where she trained as a wireless operator. Since Noor stood out as an accomplished wireless operator and was also bilingual in French and English she was invited to join the SOE on a perilous mission as a radio operative in occupied France. She was told about the potential dangers but Noor was quite eager to participate and also working as a radio operative did not compromise her principles of non violence. Not everyone was certain she had the temperament to be a secret agent. One cynical British spymaster remarked she seemed over emotional to be a spy. However his judgement may well have been due to her bold statement at her interview. She said after the war she may well return to India and fight against the British for Indian Independence. Some officers were shocked at this but others were impressed by her fearlessness and boldness. Her British commanders also expressed a little bewilderement about her “Sufi mysticism” which would have been unusual for the time. Later however the chief British spymaster went on record as saying she was the most remarkable person he had met. Noor always remained a great patriot to India and was a firm believer in Indian independence, but in the circumstances she found herself, she was willing to fight on behalf of India’s occupier, such was her belief in freedom. In 1943 Noor was dropped into enemy France and began sending radio messages from around Paris. She proved a good operator in the field and was said to have done her work very skillfully and conscientiously. Unfortunately soon after arriving the ‘Prosper’ network was broken up by the Gestapo, leaving her as the one remaining wireless operator. Her superiors in England recommended she return such was the high likelihood of capture. However Noor refused to return, instead playing a vital role as the last remaining wireless operator in Paris. At one time she was nearly caught when the Gestapo stopped her whilst she was carrying her radio machine. However she was able to bluff her way past saying it was a home cine film projector. Remarkably the Gestapo believed her and for a time she escaped. the wife of her first contact. It was believed Renee sold information to the Gestapo for a small amount of money (1000Fr) . A few hours after her arrest Noor attempted an audacious escape across the roof and nearly succeeded but for a British air raid that led to a sudden tightening of security. Thereafter Noor was sent to Germany and kept in shackles in solitary confinement in the civil prison at Pforzhei. Having a strong belief in the truth not once did Noor reveal any information. Saying only she was an operative from England. It is said that her resilience and tenacity and endurance had an effect even on the hardened prison chiefs of the Gestapo. After enduring 9 months of tortuous imprisonment Noor was transferred with 3 other SEO to the Dachau concentration camp where she was executed with a bullet to the back of her head (just days before Dachau was liberated by the Americans). It is reported her last words before being shot were ‘liberty’ Another report by a witness says a guard tried to force her to say “Heil Hitler” she refused saying “One day you will see the truth”. Noor was an exceptional person who had an impact on whoever she met. She was described as being ‘dreamer’ and ‘otherworldly’ with a capacity for clairvoyance. Her biographer said she moved with ‘a different rhythm’ to other children. Like her father Noor was also a gifted musician who also studied medicine in Paris. Her children stories were published in Figaro and a collection of traditional Indian stories, Twenty Jataka Tales, appeared in 1939. Although she was an Indian Muslim who passionately believed in Indian Indepence she was willing to make the ultimate sacrifice for a cause neither her nationality or religion compelled her to fight for. After her death she was posthumously awarded the Croix de Guerre and the George Cross (1949). Inevitably given such a remarkable life there is some uncertainty over certain details of her life, some early reports sought to romanticise her life story. However there have been 2 noteworthy books seeking to offer a clear account of her life and are both worth reading. This statement proved to be prophetic as Noor herself became honoured with the highest awards. 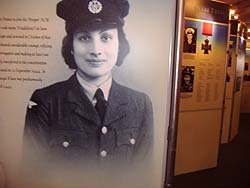 Captain Selwyn Jepson first met Noor Inayat Khan when she first joined the Special Operations Executive. He later talked about this to the Jean Overton Fuller for her book Madeleine published in 1952. Citation published when Noor Inayat Khan was posthumously awarded the George Cross on 5th April 1949.